The Capone Files: Why was Al Capone sent to Alcatraz? 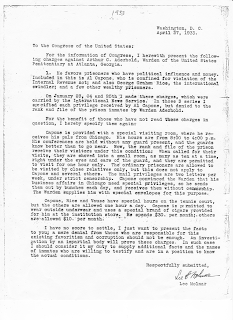 The U.S. government would love to have proven that Capone had broken the law in prison. If he had, they would have been able to bring more charges against him, and those federal charges would have added several more years to his sentence. They were probably hoping that his tax trial would put him away for a good long time, but that’s not what happened. Although originally charged with 22 counts of income-tax evasion, and violation of the Volstead Act (prohibition), the jury only found him guilty of 5 counts of tax evasion, 2 of which were misdemeanors. If found guilty on all counts he would have served a long prison sentence. Instead, he received 11 years—10 for income-tax evasion, and 1 for contempt of court. With good time, his sentence would have been reduced by one-third. Capone ended up serving just 8 years in federal prison. He never lost one day of his good time. 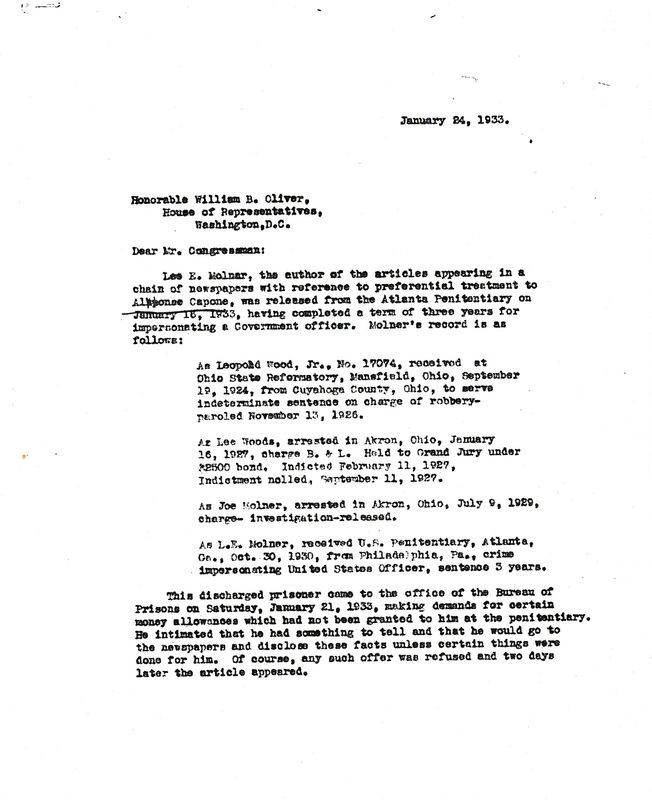 Let’s look at Attorney General Homer Cummings’s reasons for opening Alcatraz as a federal prison. In 1933, Homer Stille Cummings was appointed the first Attorney General during President Franklin Delano Roosevelt’s administration. He began his job during the Great Depression—a time when the country was seeing a great rise of infamous criminals, including bank robbers such as John Dillinger, kidnappers and thieves like Machine Gun Kelly and the Barker-Karpis gang, and cold-blooded murderers and robbers like Bonnie and Clyde. The stock market had collapsed in 1929, banks were failing, and many people had lost much or even all of their money. High unemployment worsened attitudes of the citizens to the authority of the government, and some even began to sympathize with the outlaws. Homer Cummings wanted to stop the lawlessness. He wanted to create a national police force that had jurisdiction anywhere in the United States. He wanted to capture these “public enemies” and put them in an isolated prison where escape was next to impossible. Or, as Richard Gid Powers, PhD, said in his book G-Men, “Another idea that Cummings appropriated from popular culture was the super prison for the super criminals his super police were catching.” Powers goes on to say that Cummings wanted a prison for those who had an “advanced degree in crime.” Al Capone had such a degree. 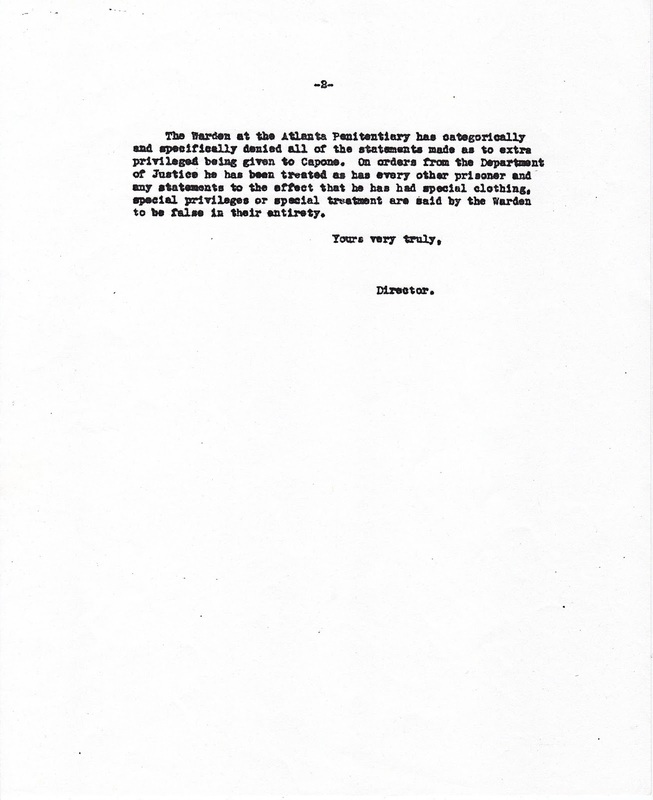 Click here to read Attorney General Homer Cummings’s speech concerning the recurring problem of crime (courtesy of the U.S. Justice Department). It was broadcast on NBC radio on October 12, 1933. Cummings now had his super prison to keep his super criminals in. On August 22, 1934, a railroad train from Atlanta Penitentiary arrived in Tiburon, California. Al Capone and 52 other prisoner were aboard the train. The railroad cars were loaded on a rail barge and towed to Alcatraz Island, where Capone became Alcatraz inmate #85. 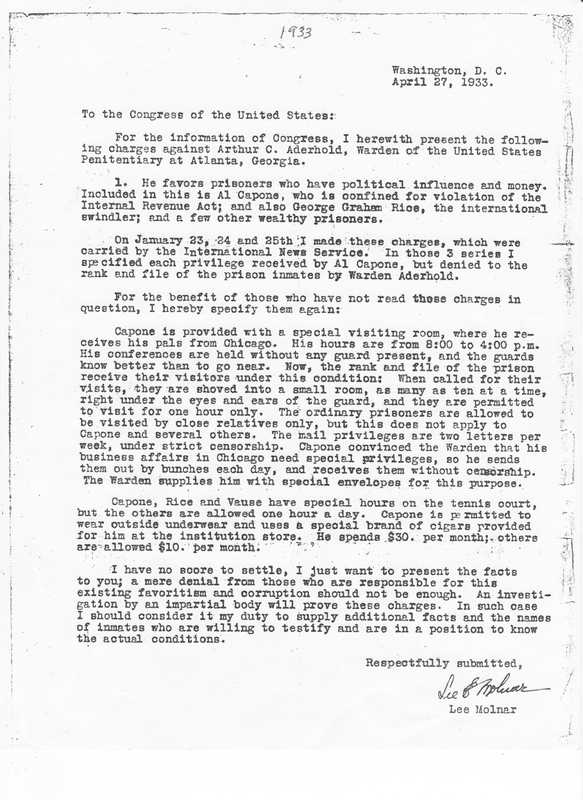 While Capone was in Alcatraz, the FBI continued to investigate stories of his alleged special treatment in Atlanta. 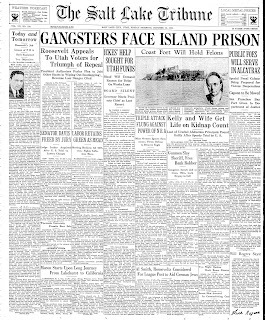 Stories of Capone’s supposed carte blanche life there had actually begun with the claims of a man named Lee Molner, a former convict at that prison. From there, the stories grew and grew. 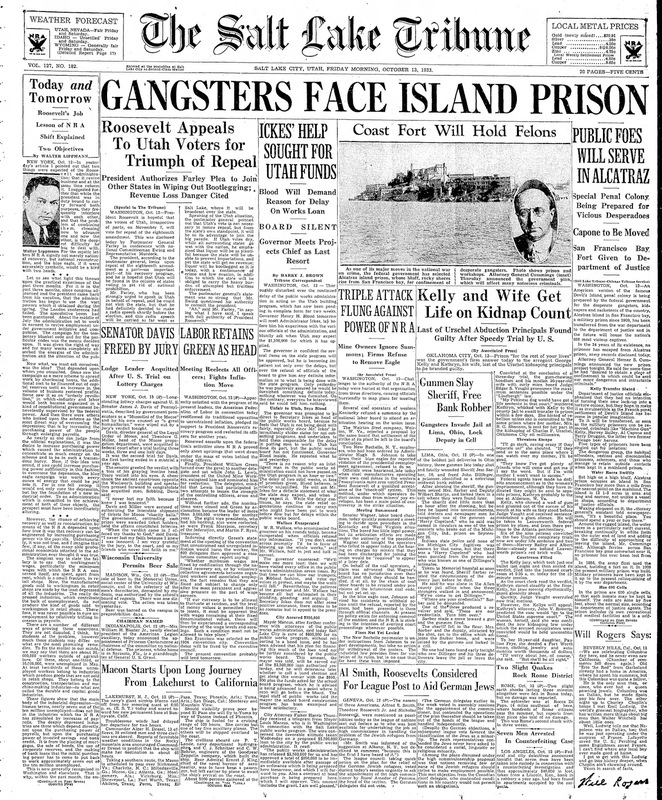 Some newspaper articles told of Capone’s wife having an apartment near the prison where Al could visit her from time to time. 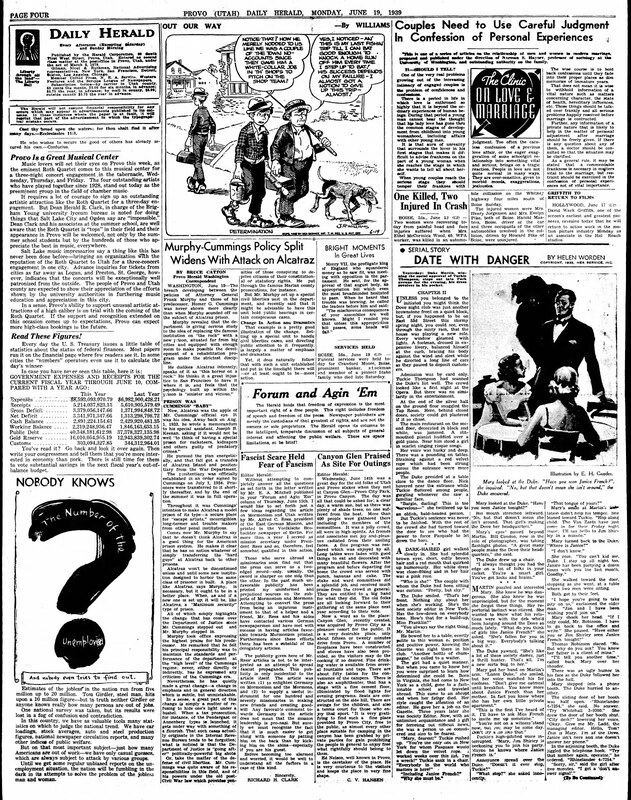 Tales of Capone smuggling contraband in and out of Atlanta penitentiary appeared in a detective magazine and became widely believed. 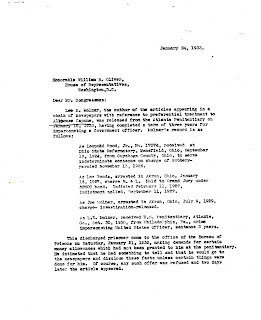 The FBI investigated this contraband smuggling claim from October 19, 1935, until February 2, 1937, but found nothing. The complete records of this investigation, including the magazine article, are on the FBI’s website. See the letters here for their conclusions. Apparently, J. Edgar Hoover never approved the closing of the case, but instead gave his tacit consent to his agents to do the job. The FBI’s investigation of Al Capone’s alleged offenses in Atlanta Penitentiary were finally over. No charges were ever brought against Capone. Tales that prison officials were forced to send him to Alcatraz because he’d been controlling Atlanta Penitentiary are false. 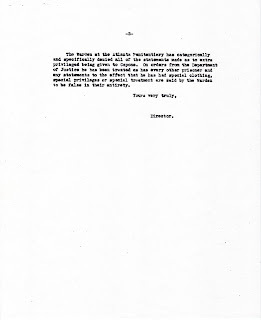 There are no facts to back up the story, which ignores Homer Cummings’ own reasons for establishing Alcatraz. On January 6, 1939, Capone left Alcatraz to serve a one-year Contempt of Court charge at Terminal Island Penitentiary near Long Beach, California. By then, most of the big name criminals from the early 1930s were in jail or dead. Homer Cummings retired in that year from his Attorney General position to go back to his private law practice. President Roosevelt appointed Frank Murphy to replace Cummings. The new Attorney General thought Alcatraz was too expensive and wanted to close it. Murphy wanted a prison that had more emphasis on rehabilitation. He also thought Alcatraz was an injustice to San Francisco and called it “this Horror on the Rock” (see article below). Murphy might have closed Alcatraz, but president Roosevelt had another job for him. After just one year as Attorney General, in January of 1940, Murphy was appointed to the United States Supreme Court. In my opinion, Alcatraz Island was to be the public icon of a tough prison for the hardened pubic enemies who Attorney General Homer Cummings wanted to incarcerate there. 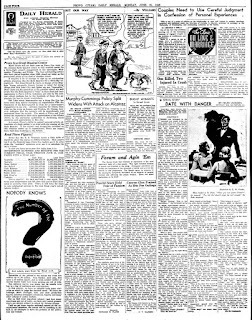 Cummings wanted to show the public that he was going to stop the crime wave of the early 1930s. He also wanted to show the American people that this new Roosevelt administration was in charge and in control. No American prisoner, then or now, had a bigger celebrity status or reputation for power and toughness than did Al Capone. That’s why he was sent to Alcatraz as soon as it opened.